Developing new sales reps has been a challenging task for any sales-focused organization. Though organizations hope to recruit reps who can start selling right from Day 1, the reality is far from that. Even a seasoned sales rep needs time to understand your company, products, customers and competitors. A 2015 study on Sales Management Optimization by CSO Insights polled more than 700 companies worldwide. It found that a staggering 59% companies took more than 6 months to get a new sales rep up to speed. The average tenure of a sales rep is around 24 months. So waiting 6-12 months for him to perform optimally means you may be losing 50% of his performance capacity. Obviously, this contributes directly to lost revenue opportunity and managerial time spent in recurrent training. If you are taking too long to ramp up new sales recruits, there is probably scope of increasing sales effectiveness by accelerating your onboarding process. Here are 5 strategies that combines age-old sales training best practices with latest technology that can significantly reduce your new recruit ramp-up time. Hire the Right Salesperson - If you cannot get the right person with the right skillset and attitude to begin with, the other strategies will hardly bear any results. A big part of getting the hiring right is having an “Ideal Sales Profile” for your organization. This profile will differ from company to company. Broadly, you can start by focusing on Attitude, Knowledge, Past Performance, Work Experience and Education. Our experience shows that organizations that have a well defined Ideal Profile are much quicker and effective in ramping up sales resources. Since the experience in the initial training period shapes the outlook of the new rep, it is essential that the sales manager also get involved in the training. An ideal training should quickly provide opportunities to the new rep for direct customer engagement, along with classroom exercise and role plays. Access to Sales Enablement Tools - Enabling sales people with correct content is crucial in a world where customers are asking more questions. Content can cover internal enablement content, e.g., playbooks, messaging guidelines, or guided selling scripts. It could also be client-facing content, such as white papers, case studies, customer success studies, tailored presentations, or business cases. Traditionally these contents were developed with a monolithic, one-size-fits-all approach. However, today’s technology solutions can help you create customized playbook or selling script for each deal based on the sales context, prior customer engagement history and other dynamics. Tools like customized playbooks and configure-price-to-quote systems help the sales rep to have access to readymade standard selling processes. While sales-focused companies are investing heavily in creating these tools, a strong emphasis needs to be made on the adoption as well. On-the-job Coaching and Mentoring - Training and coaching new salespeople on-the-job have become critical to decreasing the ramp-up time. The Frontline Sales Managers (FSMs) play an important role in training and coaching their team. Analyse a new hire’s strengths and areas of improvement and follow it up by targeted on-the-job coaching. Focus on developing a rep, rather than evaluating him/her. More often than not, assign a mentor to a new hire. Thats an effective way for the new rep to learn about company culture, norms as well as tacit knowledge. 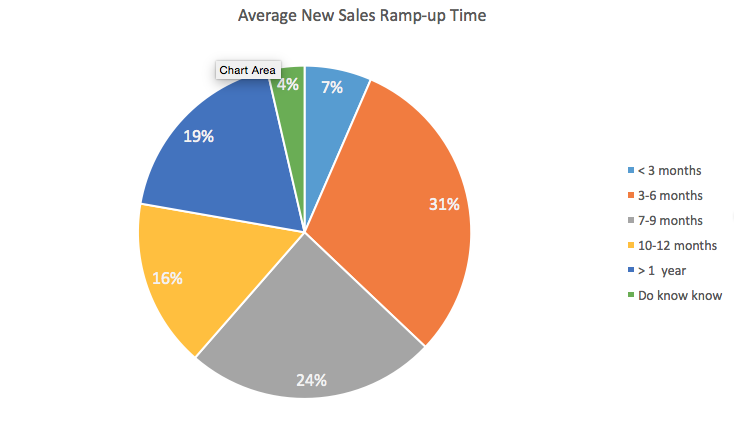 Accelerating sales rep onboarding is an often neglected area in organizational sales strategy that can give a high return with surprisingly low investment. Start now to get the maximum benefits.